If you've made it this far you must at least have a passing interest in seeing my menagerie. They're all fascinating to me but, as there are so many, I'll try to keep their stories brief for you so you don't lose the will to live. stiff and he's on medicine to ward off strokes but he's still top dog and there's plenty of life in the old boy yet. damage whenever I went out for any length of time. Bear was rescued by my neighbour in 2013 but when she had to move and couldn't take Bear with her it was Muggins to the rescue. Bear is super intelligent and very loving but my God she knows how to get into mischief. I only have to leave the room for a second and she’s on the kitchen worktop, eating cat biscuits or rummaging in the sink. She can also be food aggressive and loves plastic. With 3 TV remotes and 4 telephones destroyed and all my belongings hidden in cupboards I was on the verge of killing her or trying to rehome her. Then I got a big dog cage where she eats or stays whenever I'm not there to supervise. Problem solved and a new favourite sleeping place for other animals to boot. 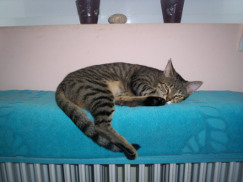 Cinders was rescued as a kitten in 2005 by Lorna, a tourist staying at the Eleanna Hotel in Skala. Lorna had heard her cries getting weaker by the day and fished her out from a crawl space underneath a slip road behind the hotel. She's now massively independent and chooses to live as an outdoor cat. As soon as I start work she disappears for the whole Summer to fend for herself in the fields nearby. But once I'm back home at the end of the season she comes in daily for her evening dinner. though (and if she can get past the bullies) - she's still happiest outside with her woodpile. Elvis was living around the bin at the bottom of my drive in 2011. He moved himself in when I rescued a tiny kitten - his inseparable companion Rudi. Rudi didn't take to comfort and ran away to live wild after a few months but Elvis was here to stay. He's very affectionate with people but an absolute tyrant with the other cats. He's introduced a reign of terror and has taught some of the younger ones how to chase off the more nervous residents and how to block access to the catflap so they can't get in for food. Despite being neutered he's also become a bit of a territorial piddler. He's skating on thin ice! My Mum moved out here in 2013 and inherited two little kittens at the end of the season (Bill & Ben). When they developed eye problems, needing round the clock medication, I took them off her hands. At 80 she didn’t need kittens launching themselves at her and getting under her feet anyway. Sadly, Bill died of leukaemia in 2016 but Ben is going strong and he's a fully trained-up Elvis terrorist. He's also a lightning fast sneak thief who will have the filling from your sandwich or the food off your plate the moment you take your eyes off him. So now you're about a third of the way through the list. If you've had enough now's your chance to escape but if you're still interested, go to More Animals and Even More Animals for the full picture of where all my money goes. "Yes, madam, I am drunk. But in the morning I will be sober and you will still be ugly"